Rectors at the University of Notre Dame play a pivotal role in cultivating the seamless integration of student life from classrooms to residence halls. They lead the residential communities that are a distinctive component of a Notre Dame undergraduate education and lie at the heart of students’ personal development and formation. In recognition of the significance of these positions, Notre Dame has launched a new priority to endow all rector positions in the 29 residential halls. Alumnus James Corgel and his wife, Christine, have created the first such endowment with a $1 million gift for the rector’s position in Dillon Hall. The endowment will underwrite a portion of the rector’s salary, allowing the University to augment programming funds and ongoing refurbishment needs of hall community and study spaces. Each residence hall hosts annual community building, academic and service events and fields intramural teams. 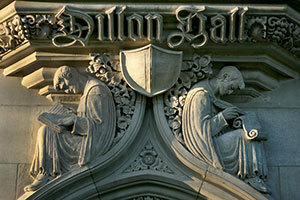 The current rector of Dillon Hall, a men’s residence, is Rev. Paul Doyle, C.S.C., who has served in that capacity since 1997. Jim Corgel earned bachelor’s and master’s degrees from Notre Dame and was a member of the Irish Guard as an undergraduate. He serves as chair of the University’s Undergraduate Advisory Council after previously serving on the Graduate Studies and Research Advisory Council. He received the Distinguished Alumni Award from Notre Dame’s Mendoza College of Business in 2006. Corgel was a member of IBM’s senior management group responsible for strategy implementation, and served in a number of key general manager roles with global responsibility. He retired from the company in July 2013, serving successfully for 38 years. In addition to his service to Notre Dame, Corgel is a Founding Partner in HUBSTART, a Westport, Connecticut-based investment and advisory group that actively assists early-stage companies and community organizations. He is a member of the board of trustees for the American Management Association and a partner in the Connecticut chapter of Social Venture Partners, a group dedicated to building business efficiency in nonprofit organizations. Chris Corgel earned her bachelor’s degree from Michigan State University. In her more than three decades at IBM, she served in a number of executive positions. She currently is a board member at the Mercy Learning Center, serves on the Connecticut Advisory Council to the U.S. Commission on Civil Rights and is a mentor for at-risk high school students. The Corgels reside in Westport, Connecticut, and are active supporters of the Diocese of Bridgeport’s inner-city Catholic schools. Originally published by Dennis Brown at news.nd.edu on March 24, 2015.